Chances are if you’re here, you want to sell your phone. Selling your older device means you can upgrade to a newer phone and put in the extra money to ensure you can get a top-of-the-range device. Whether you're bored of your phone or you just want to get rid of another device you have gathering dust in your drawers, the guide below will talk you through everything you need to know before selling your phone - whether via a network, eBay or a phone recycling website such as MusicMagpie or Envirofone. Whether you have an iPhone, an Android, a BB10 toting BlackBerry, a Windows Phone or any other phone, below you’ll find the best tips on selling your device as well as a guide through what you'll need to do to sell it on. When is it best to sell my phone? The best time to sell your phone is as close to the device’s original release date as possible. If it’s a newer device, it will be worth more money than an older one. 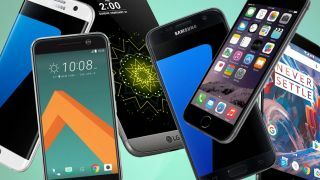 If you know there are newer devices in the family of phones coming up we’d also recommend selling on your older phone before the new device is announced. Search online for your model of phone and what you expect the next version to be called to see when the release date is expected. For example, if you own the iPhone 7 and want to upgrade to the next version you should check out our iPhone 8 rumors round up to know when the next version should launch and when you should sell on your phone. If you can sell a few weeks before the release of the newer device, you’re more likely to make a quick sale and get more money for your device. If you have an older device, it's usually just best to sell it on as soon as possible to make the most money and garner the most interest in your sale. How much will I get if I sell my phone? We can’t estimate the exact amount you’ll make from your phone, but we can tell you what buyers are looking for and how you can maximize the amount you'll make from your sale. The age of your device is one of the big selling points. If it’s newer, it’ll be worth more money as it’s likely to last longer, is more likely to get regular software updates from the manufacturer and there will generally be more interest in people looking to buy your phone. It’s also worth checking the condition of your phone. If it’s damaged - anything from a broken screen to the odd dent and little scratch - you need to admit to yourself the phone may not be worth as much as if it was brand new. If you’ve managed to protect it in a case and still have the original packaging, you’ll likely be able to get more money for your device. That said, even if your device is broken you’ll still be able to sell it to someone, you just may not get as much money for it. The model itself is by far the biggest factor in the price of your device. If you own a new iPhone 7 Plus, it’ll be worth more money than a Windows Phone device like the Microsoft Lumia 950 XL that is a few years older. The best way to predict how much your phone is worth is by looking at how much others are selling the same version for so be sure to look around for your phone online. What to do before selling my phone? You should take some time to see what price other people are selling your exact model of phone for to check you’re not going to be ripped off. Something to bear in mind is the storage available in your phone. For example, if you own the 64GB Samsung Galaxy S7 Edge, it’ll be worth more than the 32GB version, so it’s worth looking in the Settings on your phone to ensure you know what version you own. Take a look at the recycling, auction and sale sites in the next section below to check how much your phone is worth before you start trying to sell it. Doing this may mean you can avoid getting screwed over. This can be hard to do as you may realize your phone isn’t worth as much as you’d hoped. If you have damaged your device, make sure you’re clear about it with whoever you’re selling to. If you try to cover up the condition of your device it may damage your reputation on auction websites and some deals will even be invalidated if you’ve lied. This is something a lot of people forget to do, but you have to make sure you’ve reset your device before you then sell it on. You can hard reset all modern smartphones, which means it will then delete all of your data that’s currently on there. Without doing this, whoever buys you phone may have access to your data, your private accounts and you’ll likely lose things in the process too. Before resetting your phone also make sure you’ve backed up any data you want to save to use on your next device such as music, photos and videos. How do I sell my phone? When you think of selling your phone, your thoughts likely jump straight to selling it on eBay and while that’s a great option there are a lot of other routes you could go down as well. eBay gives you a huge user base all over the world as well as security in your sale, but there are other auction sites on the web as well as car boot-style options such as Gumtree, Facebook Marketplace or Schplock. All three of these car boot services allow you to sell directly to someone and trade in cash so you won’t end up having to give any money to eBay from your sale. It does offer less security though and you’ll have to meet up with the people you’re trading with. A variety of manufacturers and retailers offer a service where they will buy your phone from you. Think about Carphone Warehouse, CEX and GAME or networks like EE, Vodafone, Three and O2, which will all offer money for your phone. This option gives you the security and the knowledge you will eventually receive the money, but you may not get as much money as if you sold directly to someone else. Usually these retailers will offer a lower price so the companies can sell it on for a profit, so it may be worthwhile taking a look at how much CEX, GAME or Carphone Warehouse are offering you before you decide to go with this option. It may not be the most profitable option, but if you want a quick and easy sale for your phone you could always use a recycling website. Options such as MusicMagpie and Envirofone and many others offer a service where you can log what device you have and send it to them to get the money quickly and easily. You’ll then usually receive a bank transfer or a cheque in the post for how much money the company thinks your phone is worth. Beware the condition of your phone may heavily affect how much you can make this way, but you can always refuse the sale if you don’t think the service is offering you enough money for your device and it will be sent back to you in the post. Last but not least, do you know anybody who would want to buy your phone? Have a think and see if you can think of anyone who has shown an interest in your phone before and see if they want to buy it off you for an appropriate price. You could even post a Facebook status or ask on Twitter to see if there's anyone you know looking to buy your phone.